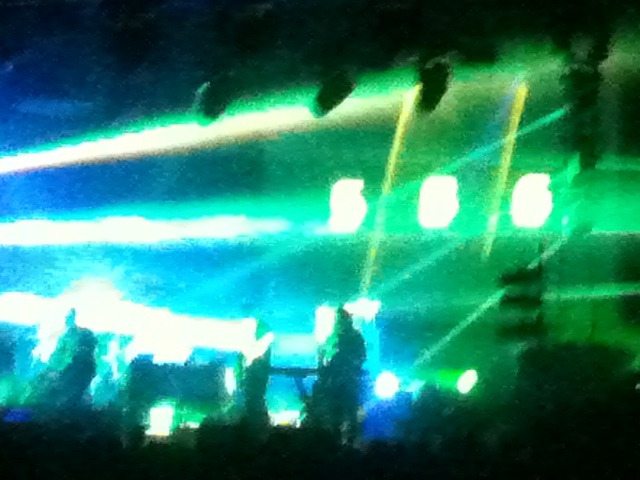 I saw New Order play at the Thebarton Theatre 25 years ago, and remember being very disappointed. The sound was atrocious, the band seemed pissed off, and they played a short set of obscure album tracks, b-sides and thrashy versions of otherwise likeable songs. The only semblance of a hit was ‘Bizarre Love Triangle’. The event wasn’t quite damaging enough to warrant a sacrificial burning of my New Order collection, but it made me wary of committing to any future New Order live experiences. In the years since I’ve seen video footage of many competent, even very good, live New Order performances. Was it possible that my 1986 experience was a rare aberration? Did Hooky have a headache? Did Gillian forget to plug in her keyboard? Was the band under some sort of collective trance that made their music almost unlistenable? Whatever the reason, when it was announced that the band were reforming (minus Hooky) and touring Australia, I jumped at the chance to see one of their shows, assuming that they’d overcome whatever ailed them on their ’86 tour. The temptation was too great! Would they play ‘Your Silent Face’? Would Bernard wear shorts? Would Gillian press the wrong key and summon the Walrus from Hell? And so, I found myself, along with thousands of others, jammed into the Hordern Pavilion on an unusually wet and cold night in March. The excitement was palpable – fans with greying and/or receding hair donned New Order t-shirts, others wore Gillian masks, while a small minority wore black armbands in protest at Hooky’s absence. I managed to get a seat to the right of the stage – not the best spot for sound, but the view of the stage was good. After a brief introductory ‘Elegia’, the band launched into a stomping version of ‘Crystal’, followed by the highlight of their ‘Republic’ album, ‘Regret’. From there, the band went from one great tune to another – ‘Age of Consent’, ‘Ceremony’, ‘Temptation’, ‘Krafty’ and so on. While the sound tended to get a bit murky at times, it was mostly excellent, particularly on those tracks with an electronic heart. ‘Bizarre Love Triangle’, ‘Blue Monday’ and ‘Perfect Kiss’ were all especially good, but it was a version of ‘586’ which was the highlight of the night for me. The only complaint I had was their insistence on playing ‘Love Will Tear Us Apart’. Although it wasn’t so much that they played it, but how they played it. For me, the song works best with restraint and subtlety, allowing the simple melody to shine through. Their version at the Hordern Pavilion was more akin to Status Quo than Joy Division. They even employed a bizarre shriek during the chorus, which was perhaps meant to represent Ian Curtis’s reaction to this horrific rendition. Despite this hiccup, the show was over too soon and we were tossed out into the rain, humming ‘Blue Monday’ in time to the sound of traffic and water as we plodded towards home. This entry was posted in music and tagged 586, age of consent, bernard sumner, bizarre love triangle, blue monday, ceremony, gillian gilbert, hooky, hordern pavilion, krafty, love will tear us apart, new order, regret, stephen morris, temptation by Graham Catt. Bookmark the permalink.